first, the RCTC campus is closed tomorrow, so i get a free day! woo! second, with this cold snap we’re having (we seem to be having quite a few this winter), there is an actual positive side to this: the emerald ash borer might be drastically reduced due to the cold, which your ash trees will be severely grateful for. i’m hoping the mountain pine beetle that is overtaking the black hills trees, mostly ponderosa pines, and basically killing them will also be affected by this. the last couple times i went out to the hills, i read up on how the bug is spreading throughout the hills, and the only thing that can really stop them is extreme cold – it will kill the larvae. unfortunately, there hadn’t been extremely cold winters in SD in a while; the beetle kept propagating. 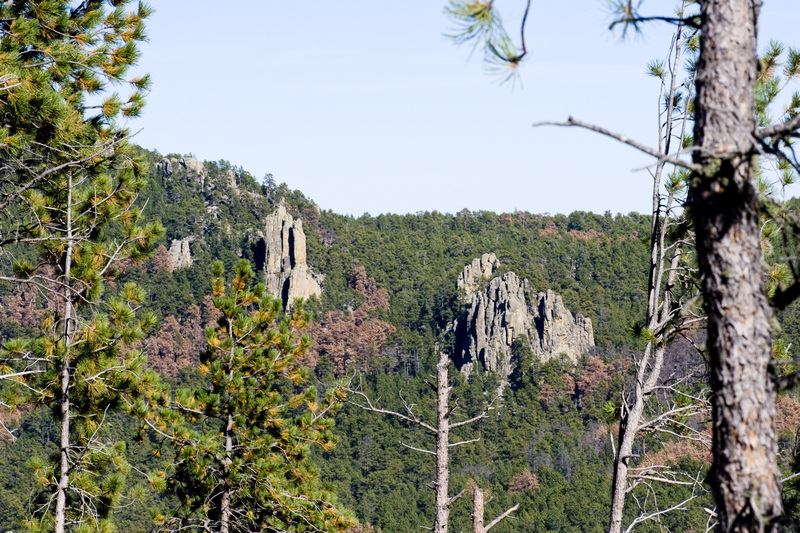 The first recorded outbreak in the Black Hills occurred in the late 1890s. An estimated 10 million trees were killed during this outbreak. Approximately five outbreaks have occurred since that time though none has reached the same magnitude. The outbreak in the early 1970s resulted in the loss of more than 440,000 trees. The last outbreak occurred from 1988 to 1992 and resulted in the death of approximately 50,000 trees. Beetle populations are increasing and are expected to continue to increase during the next five years. i took this picture in 2010 – you can see how some of the trees on the hillside are brown while the others are green. the forest rangers (i would love that job!) have been taking photos of the progression and when you visit mount rushmore and take a tour through the information side of it, you can see the damage the bugs have done to the hills over the last 20 years or so. pretty disturbing, loads of organizations like www.TheToolBoss.com are trying to raise awareness and to prevent the worst. turns out that once the beetles are in hibernation, they can tolerate temps down to -30. i’m not sure if SD got down to those temps or not, but with -24 predicted here, hopefully SD will get down to those temps at least sometime this winter.